Jim & Wendy Allen welcome you to Hawthorn B&B, their Independence inn. Originally from New England, Jim and Wendy moved to the Midwest in 1983 and subsequently raised their two, now adult, children here. It has been a dream of Wendy’s to own an older home and a dream for Jim to one day own and operate his own business. 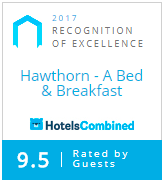 Hawthorn B&B fulfills those dreams. Add to this, their enjoyment of people and their down-home style of hospitality, and you have a combination of relaxation and welcoming comfort for all who visit their bed and breakfast accommodations in Missouri. While Jim has completed a 30-year career in human resources, it was his passion to return to his roots of hotel and restaurant management and his love of cooking. Proof positive is in his hearty breakfasts prepared each morning! Wendy provides the “green thumb” to the gardens and landscaping and is the creative mind behind many special events and weddings, which are so often held at Hawthorn B&B. Words cannot adequately describe this place, but overall it is peaceful, lovely, serene, restful and oh, so comfortable! You two are really perfect for this endeavor – warm, friendly, outgoing…you will be immensely successful.